A making-of film of KIM Yong-hwa’s Mr. Go, the first full 3D film in Korea, has been released. Mr. Go is a bright film about the baseball playing gorilla Ling Ling, who enters a professional baseball team and his 15-year-old manager Wei Wei. In the beginning of the clip, Ling Ling pitches the ball at the center of a baseball stadium packed with spectators. Lively visuals and the real motions of the digital character Ling Ling are strong enough to impress audiences. Minute details such as facial expressions and hair strands make Ling Ling look realistic. 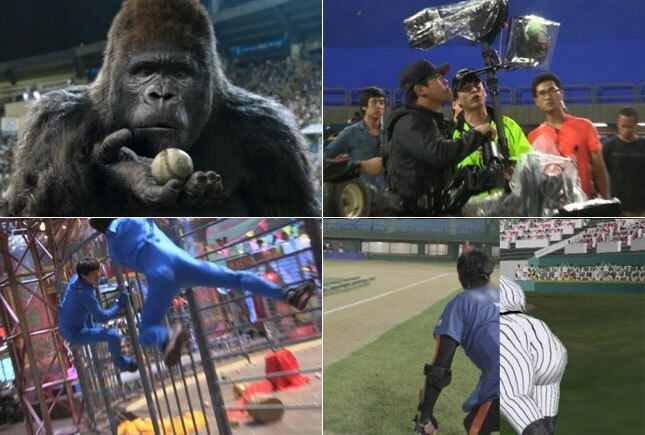 The shooting scene during which director KIM orchestrates the production, the process of bringing the CG gorilla to life and the full use of cutting edge 3D filming equipment as well as the latest devices including helicams and skywalker cameras will only lead to increased expectations. Mr. Go is currently in post production and will be released in July.